Wooga, a startup based in Berlin and founded in 2009, develops games for social networking sites that users can play on Facebook or on their smartphones and tablets as well as cross-platform. The company’s games (which include Monster World, Magic Land, Bubble Island and Diamond Dash) are available in up to 20 languages. More than 250 employees from over 40 countries work to develop new games in small, independent teams of around 15 people. Each team is free to choose their own tools and decide whether to host games in the cloud or on a physical machine. Wooga needed a cloud solution specifically for social games, which have a variable and unpredictable number of players who require quick reaction speeds and high server reliability. These browser-based games can attract significant numbers of players in a short time. For example, Wooga’s Monster World has approximately two million players per day, corresponding to 15,000 requests per second at its peak, according to the company. Monster World runs entirely on the AWS Cloud. 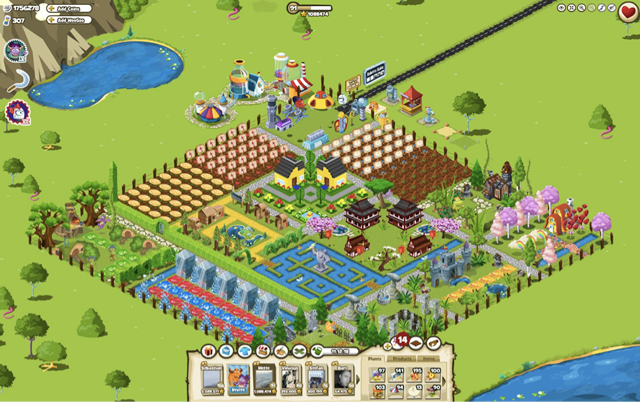 Another Wooga game, Magic Land, has 850,000 players per day, corresponding to 5,000 requests per second at its peak. A game’s success or failure is determined largely by adoption rates—the number of users who decide to play. The number of players can be unpredictable; for some games, that number increases rapidly and then drops again. The challenge for Wooga is to continuously engage the players’ interest and provide for a high retention rate. Monster World is a game with classic game architecture, using a stateless application server and central databases. Magic Land, by contrast, sits on non-standard architecture with stateful application servers, using Amazon Simple Storage Service (Amazon S3) instead of databases. See Figure 1 below for a screen capture of Monster World. Flexible scalability of compute capacity. Games draw an unpredictable number of players, making it difficult to calculate the number of instances needed at any given time. Because Wooga’s capacity needs are highly variable, the server instances used need to be determined quickly and accurately. A high degree of automation to enable the rapid deployment of a large variety of tools, as quick reaction speeds are a decisive factor for social games in the market. Solid server reliability. If a game is offline, players will move on to the next. A solution that would work for small, agile teams, as Wooga runs a lean engineering organization. Wooga requires easily scalable compute capacity to help the system adapt to fluctuating traffic volumes. The company also needed a solution that would support their lean resource allocation model, enabling small teams to work quickly to bring a game to market. AWS, with its flexibility and ease of use, provided this as well. Wooga uses Amazon Elastic Block Store (Amazon EBS) with Amazon EC2 instances to store social gaming data. Amazon EBS allows for storage outside the instances, thus providing independence from an instance’s lifespan. Amazon Simple Storage Service (Amazon S3) is also used for Wooga’s games, providing a simple web service interface designed to store and retrieve any amount of data at any time, from anywhere. To learn more about how AWS can help your gaming application needs, visit our Gaming details page: http://aws.amazon.com/game-hosting/.